Bylakuppe is a small town located near Mysore (90 kilometers) district of Karnataka, established by Lugsum Samdupling in the year 1961 and by Dickyi Larsoe in 1969. It has the largest number of Tibetan people, and the place has now grown into full-fledged town housing the largest Tibetan population. Bylakuppe is a pleasant and peaceful town that has divided into 4 camps. The famous monastery called as Namdroling is located in Bylakuppe. The houses located in the town are different with the Tibetan style tiled roofs. Usually the Monks are dressed with chrome Yellow and maroon color dress which symbolizes as saints (preaching of Buddha). The multi colored Tibetan flag which includes (red, white, green, blue and yellow colors) is known as “DAR CHO” (in Tibetan language) and the bells are tied which flutters in the wind. Thangka is derived from the Tibetan word 'than' which means flat and 'ka' means painting (according to the book “Art of Tibetan Painting” referred by artisans in Bylakuppe) which is one of the traditional paintings originated from Nepalese art form exported to Tibet that is practiced in Bylakuppe as well. Thangka is a complex three-dimensional object consisting of a picture panel which is painted or embroidered on silk or cotton textile. 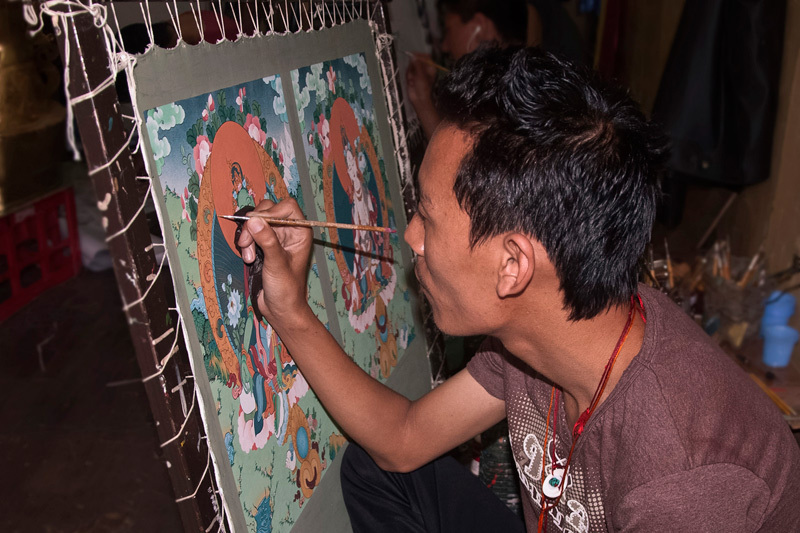 To make a thangka painting, the painter should have precise knowledge of the measurements and proportions of each deity as established by Buddhist iconography. In the Buddhist land, these are not just colorful wall hangings but symbolize the divine beauty. This is a painting done on a flat surface which can also be rolled up like a scroll when it is not on display. Buddhism has strong influence of development in Tibet culture since introduction from 7th and 12th centuries and also in neighboring countries like India Nepal and china. 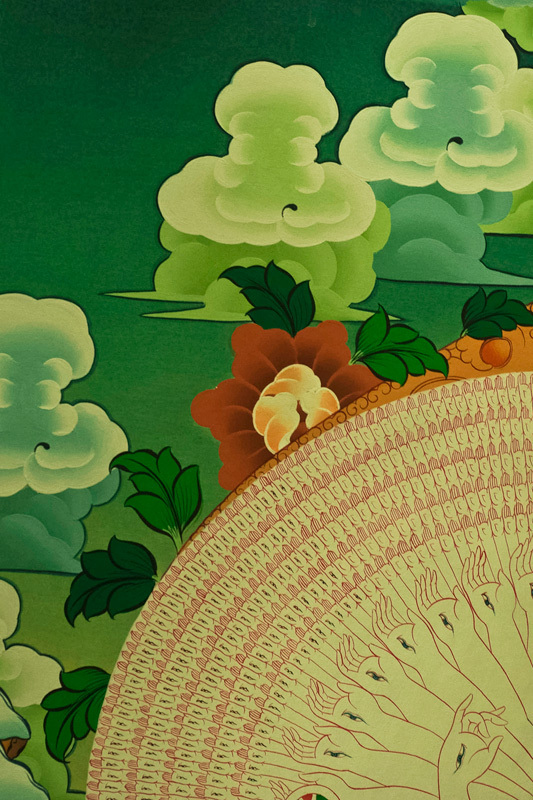 The art and culture of Tibetans consist of the elements of Buddhist beliefs, the paintings made on cotton and silk cloth are traditional paintings depicting religious and theological subjects. 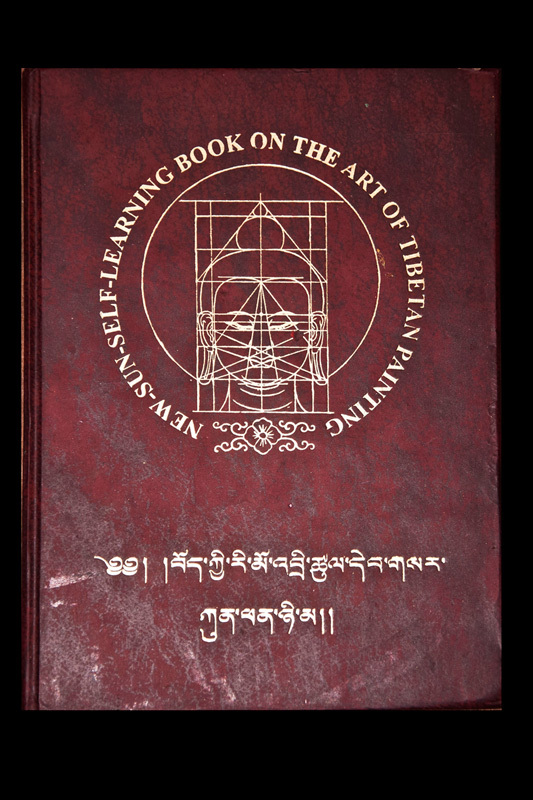 The art of Thangka paintings has reached the classical levels in Tibetan culture and traditions. Thangka painting is an art depicting the life of Buddha and other deities. It also influences the mythological event relating and concerning to Lamas. 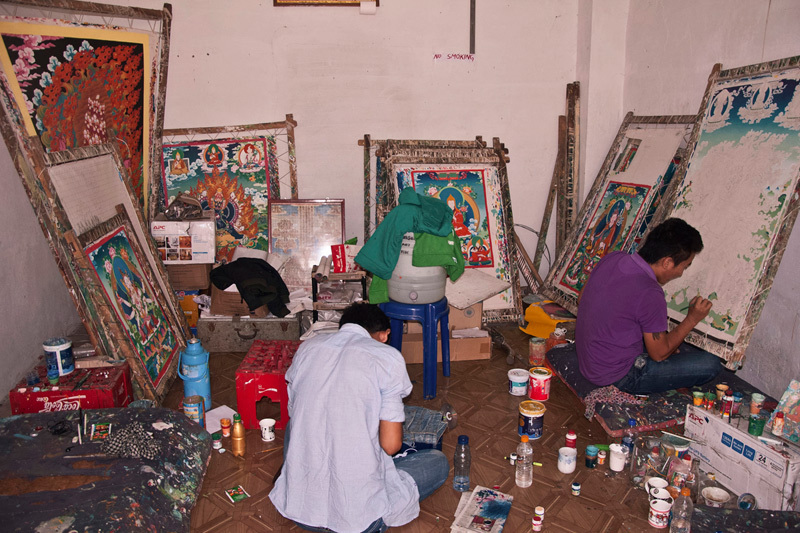 The devotional paintings of Thangka are used in ceremony and prayer rituals. Most importantly, this religious art is used as a meditation tool to help bring one-self, and to the path of enlightenment. Green Thara is also called as “Mother of All Buddhas”. 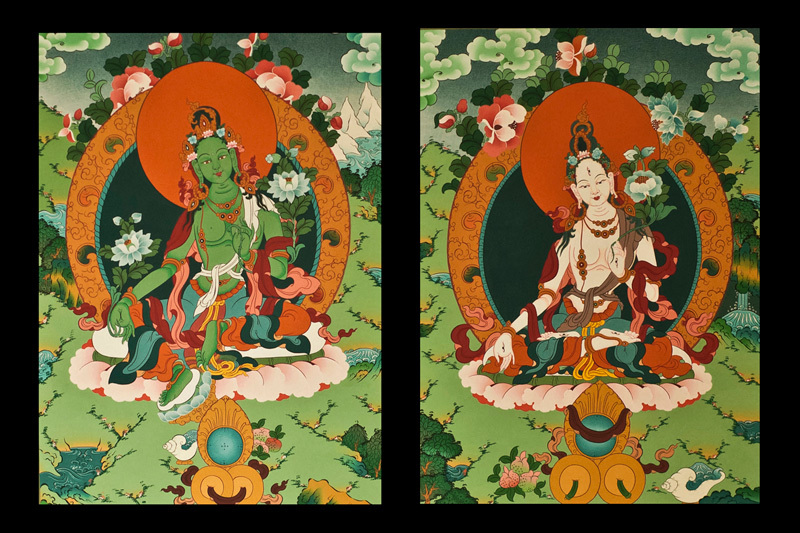 The paintings of Green Tara are made to protect against the Eight Great Dangers. Mainly Green colour is used for the making which indicates the nature and active compassion of the Goddess. The goddess is known for helping those in need with quickness of lightning.